Important for excursions of any kind into mountains anywhere, the weather forecast has to be the first thing to check. Here are the best weather information sites, gadgets, widgets (whatever you want to call them) and webcams for the Picos de Europa that we've found. This next live feed is for weather conditions around Potes, Cantabria. And one from Meteored.com, a highly interactive Spanish weather site with great photos and a busy forum. This prediction is for Cabrales in Asturias including the north end of the Cares gorge. 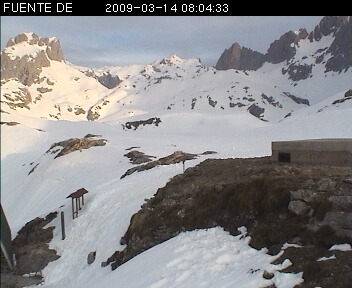 Finally, a link to the webcam at Fuente De, the only cable car in the Picos, rising to the Central Massif in Cantabria - handy for checking out cloud base levels during inversions too. Note, the image below is not live!